Item #SS-553: 7" long Sterling Silver Graduation Bracelet with five charms (diploma, mortar board, #1 GRAD, student, book); Lobster claw clasp. Item #QG-QG1670-7: 7" long Sterling Silver Bracelet with five Ichthus charms (charm combines Ichthus, Cross & Dove) of 5.84 grams; Lobster claw clasp. Item #CH-UNO-226: 7.25" long Sterling Silver Bracelet with five 17mm Round Discs with Black Enamel of 18.00 grams. Lobster Claw Clasp. 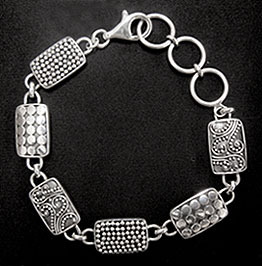 Item #SC-BLF1-0085-X1: 7 1/2" long Rhodium-plated Sterling Silver Bracelet with ten 4mm square Iolites of 3.22 cts. TW; Slide Clasp and safety. Item #SC-BLFG-0058-X1: 7.5" Rhodium-plated Sterling Silver bracelet with thirteen 4x6mm oval Almandite Garnets of 7.48 Cts. TW and lobster claw clasp. Item #CH-722-DER-B298: 7.75" Adjustable Rhodium-plated Sterling Silver Southern Gates balcony bracelet with adjustable smart bead lobster claw clasp. Item #SS-951: 7.75" long, Sterling Silver Ladybug Bracelet. 17.52 Gms. Toggle clasp. Item #CH-ROPE-050-8: 8" long 2.5mm wide Sterling Silver Rope Bracelet; Lobster claw clasp. 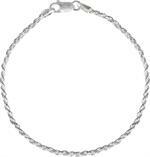 Item #CH-ROPE-040-8: 8" long 2mm wide Sterling Silver Rope Bracelet; Lobster claw clasp. Item #QG-QCH070-8: 8" long 5mm Sterling Silver Charm Bracelet; Lobster claw clasp. 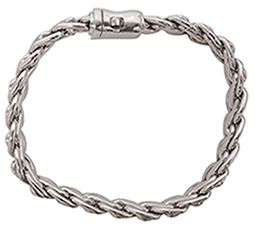 Item #SS-2104: 8.5" Indiri Collection Sterling Silver heavy woven link bracelet with barrel clasp. 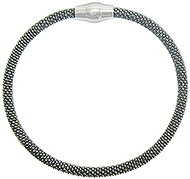 Item #RC-AGW1602-0750: Antiqued Sterling Silver Mesh Bracelet with Rhodium-plated Sterling Silver Magnetic Clasp; 7.73 Gms. TW. Item #SS-1639: 6.5" - 7.75" Handcrafted Indiri Collection Sterling Silver bracelet with seven 12mm round Fresh Water Cultured Pearls and lobster claw clasp. Item #SS-2364: 6.5" - 7.75" Handcrafted Indiri Collection Sterling Silver Bali bracelet with seven 10mm round Turquoise cabs and lobster claw clasp. Item #SS-1705: 6.5"-8" long Handcrafted Indiri Collection Sterling Silver Bracelet with nine 6x8mm oval Amethyst; Lobster claw clasp. Item #SS-1666: 6.5"-7.75" long Handcrafted Indiri Collection Sterling Silver Bali Beaded Fringe Bracelet of 27.59 grams; Lobster claw clasp. Item #SS-1638: 6.75" - 7.75" Handcrafted Indiri Collection Sterling Silver bracelet with nine 7mm round Turquoise cabs and lobster claw clasp. Item #SS-1892: Adjustable 6.75"-8" long Indiri Collection Sterling Silver Nailhead Design Link Bracelet; Lobster claw clasp. Item #SS-1966: 6.75"-8" long Handcrafted Indiri Collection Sterling Silver Bracelet with eight 7x9mm oval faceted Black Onyx; Lobster claw clasp. Item #SS-1539: 7"-8" long by 12mm wide Handcrafted Indiri Collection Sterling Silver Rectangular Link Bracelet of 22.53 grams; Lobster claw clasp. Item #SS-1538: 7 3/4" long, 1/2" wide Handcrafted Indiri Collection Sterling Silver Byzantine bracelet of 50.11 grams with slide clasp. Item #SS-1687: 9mm wide Handcrafted Indiri Collection Sterling Silver Bali Flat Filigree Bangle; 2 1/2" inside diameter. Item #IC-B041: Adjustable 6 3/4" - 8" long Sterling Silver nailhead design link bracelet with lobster claw clasp. Item #SS-1862: 1/4" wide Handcrafted Indiri Collection Sterling Silver cuff bracelet with woven motif. 2 1/2" inside diameter.